For other uses, see Portage (disambiguation). Portage or portaging is the practice of carrying water craft or cargo over land, either around an obstacle in a river, or between two bodies of water. A path where items are regularly carried between bodies of water is also called a portage. Going upstream was more difficult, as there were many places where the current was too swift to paddle. 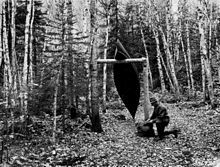 Where the river bottom was shallow and firm, voyageurs would stand in the canoe and push it upstream with 3-metre (10 ft) poles. If the shoreline was reasonably clear the canoe could be 'tracked' or 'lined', that is, the canoemen would pull the canoe on a rope while one man stayed on board to keep it away from the shore. (The most extreme case of tracking was in the Three Gorges in China where all boats had to be pulled upstream against the current of the Yangtze River.) In worse conditions, the 'demi-chargé' technique was used. Half the cargo was unloaded, the canoe forced upstream, unloaded and then returned downstream to pick up the remaining half of the cargo. In still worse currents, the entire cargo was unloaded ('décharge') and carried overland while the canoe was forced upstream. In the worst case a full portage was necessary. The canoe was carried overland by two or four men (the heavier York boats had to be dragged overland on rollers) The cargo was divided into standard 41-kilogram (90 lb) packs or pièces with each man responsible for about six. One portage or canoe pack would be carried by a tumpline and one on the back (strangulated hernia was a common cause of death). To allow regular rests the voyageur would drop his pack at a pose about every 1 kilometre (0.5 mi) and go back for the next load. The time for a portage was estimated at one hour per half mile. Look up portage or portaging in Wiktionary, the free dictionary. Wikimedia Commons has media related to Portages.